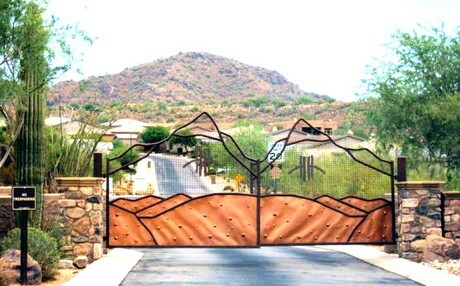 Hidden Hills is a master planned community in North East Scottsdale located next to McDowell Sonoran Preserve. Nestled between other well-known Scottsdale Communities of Scottsdale Mountain, Ancala, and the city of Fountain Hills; Hidden Hills real estate is within a short commute of the 101 freeways, shopping, and dining establishments. Residents of Hidden Hills enjoy spectacular mountain and city light views combined with quality construction. Phoenix based builder Golden Heritage Home, began construction of these semi-custom homes as well as custom homes in 2000 and was completed by late 2005. With twelve 12 distinctive floor plans and numerous exterior color choices there is something everyone. Many of the models offered separate casitas and interior courtyards that make Hidden Hills feel more like a custom home neighborhood. In fact, there are a few custom lots available to build your dream home. Current home prices start in the $500s and up to $3M for custom home sites. Hidden Hills is just a stone’s throw from Sunrise Trail, a popular trail that winds through the mountains. It has a 2,852 foot elevation with spectacular 360 degree views of the Valley. Hidden Hills gained its popularity for its natural desert beauty and untouched preservation. Hidden Hills is also a "dark sky" community, a place that aims to protect the quality of its dark, star-filled sky by controlling the amount of outdoor lighting. If you are looking for lovely scenery, stately homes, influential neighbors and a certain style of living then Hidden Hills is a great place to call home. You'll find the very latest homes for sale in Hidden Hills featured below. This information is updated throughout the day so be sure to check back often! Search the complete inventory of Hidden Hills homes for sale by price, community amenities, square footage and more using our detailed ADVANCED SEARCH option. See something that interests you? Want more information? Contact Us anytime to schedule a private showing for any property you find on this site or for more information on the community of Hidden Hills and all Scottsdale area real estate.